This quiz is dedicated to that horror film subgenre devoted to masked maniacs terrorizing frisky teenagers with sharp implements. See if you can hack and slash your way to victory! The American slasher movie owes many of its basic tropes to WHAT FILM GENRE, derived from the Italian word for "yellow," because films in this genre were often based on violent novels printed on pulpy yellow paper? Contrary to popular belief, Michael Myers in the first film of the Halloween franchise is not wearing a hockey mask, but instead is wearing a Halloween mask of WHAT TV ACTOR that had been spray-painted white? John Carpenter's Halloween was heavily influenced by WHAT FILM from Canada, made in 1974 with a holiday theme, that depicted a house full of sorority sisters bumped off by an unseen killer? The screenplay to the 1982 slasher Slumber Party Massacre was written by WHAT NOVELIST known for the lesbian cult novel Rubyfruit Jungle and a series of detective novels about her cat Sneaky Pie? The Burning, a 1981 slasher film produced and written (respectively) by two brothers named Harvey and Bob, was the first movie ever released by WHAT PRODUCTION COMPANY? 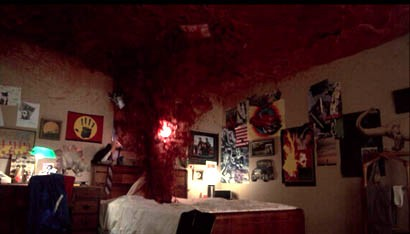 WHAT ACTOR, still currently on the Hollywood A list, portrayed the third victim of Freddy Krueger in Nightmare on Elm Street, whose death is depicted in the picture below? WHAT TERM, originally coined by Carol Clover in the book Men, Women, and Chainsaws: Gender in the Modern Horror Film, refers to the primary female protagonist of a slasher film, a term later used as the title of a 2015 Abigail Breslin film? WHAT ACTRESS won a Razzie Award for her performance in the 1981 slasher flick Hell Night, eight years after she beat 600 applicants for a role in a previous horror film? John Travolta plays a sound man for a slasher film called Co-Ed Frenzy in WHAT 1981 FILM about a political assassination conspiracy, directed by Brian de Palma? WHAT DIRECTOR wrote his first screenplay for the film, Nightmare on Elm Street 3: Dream Warriors, but is now better known for directing the #1 user-rated film in the Internet Movie Database, as well as several other Stephen King adaptations? Scream, the 1996 film that revived the slasher subgenre, had a twist ending that revealed the murders in the film had been committed by two masked killers instead of one. Identify EITHER ACTOR who portrayed one of the killers revealed at the end of the first film franchise.